Serving-Ice-Cream.com asks, "What's going on in the ice cream world? ": Is a Vanilla Ice Cream Shortage On the Way? Is a Vanilla Ice Cream Shortage On the Way? We’re used to seeing gas prices rise and fall as world events affect the cost of oil. We expect to see fresh produce cost less during certain months than others. 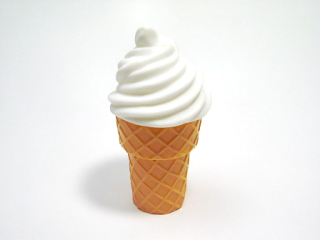 But when it comes to vanilla ice cream, most of us expect prices to stay about the same as they’ve always been. But did you know that vanilla is one of the most expensive spices in the world? The painstaking processes that workers must follow to produce vanilla; catastrophic weather events; and a dramatic drop in the number of crops around the world, have all combined to reduce the amount of this critical ingredient that is available for purchase. Vanilla farmers must pollinate plants by hand—just imagine the manpower and time that that process alone must take! This effort translates directly into high prices for the customer. The plant can only grow in certain climates, so it must be shipped in from Mexico, Madagascar, or Indonesia. Finally, a vanilla plant takes at least four years to begin bearing its well-known pods, each of which contains thousands of miniscule flavorful seeds. Floods, storms, and other natural disasters in these countries in the early 2000s wiped out many crops, and farmers have not yet completely recovered. Vanilla ice cream would cost far less if it didn’t require this prized spice. At a whopping $227.00 per pound, vanilla is second only to saffron in market price. It’s by far the most expensive ingredient ice cream producers have to buy. And experts predict that, as the current shortage reaches a critical point very soon, that price will quickly rise. Even aside from natural disasters, many former vanilla producers have found more profitable purposes for their land and no longer grow vanilla. This means that there is very little hope that a resurgence in production will bring the price of vanilla ice cream back down. For now, however, vanilla ice cream is thankfully within the budget of most families. Better yet, pick up some vanilla extract at the store and make your own! Our site offers directions for making this rich dessert with or without an ice cream maker. As you enjoy a bowl of creamy ice cream flavored with this ancient, valuable spice, you can read the New York Times’ article on the vanilla shortage for some more interesting facts. And you may just want to start a family “Vanilla Piggy Bank” in case your ice cream costs skyrocket!